Long before most in the business press rose to the challenge, Gretchen Morgenson was reporting that the financial sector had gone rogue. On April 27, Lloyd Blankfein, chairman and chief executive of Goldman Sachs, sat down for a meeting at Goldman headquarters with Gretchen Morgenson, reporter, columnist and senior editor of the New York Times. The Wall Street titan and the Pulitzer Prize winner had never met, but this wasn’t the usual polite getting-to-know-you session between reporter and source. “I feel like I’ve been waterboarded,” Blankfein told her, according to people familiar with the discussion. Blankfein was being dramatic, but he had reason to feel that way. It was Morgenson, after all, who had written the story this past fall that stripped the veil of secrecy from the most momentous closed-door deal in the annals of US finance: the government rescue of fallen insurance colossus American International Group. The September 28 story, “Behind Insurer’s Crisis, a Blind Eye to a Web of Risk,” was the first article published by a major news organization to reveal that the true beneficiaries of the bailout were the institutions to which AIG owed money, known as counterparties (mainly Wall Street investment banks). The 2,700-word piece said, among other things, that an AIG collapse “threatened to leave a hole of as much as $20 billion in Goldman’s side” and that Blankfein attended a meeting at the Federal Reserve on September 15, the same day decisions were made to let Lehman Brothers fall and to save AIG. Today this is common knowledge; until this story ran, though, it wasn’t. The article was about as bold and valuable as business stories come and involved no small journalistic risks for the Times. Goldman, for instance, was able to wring a correction on the story and still feels wronged today. Treasury Secretary Timothy Geithner, who was then president of the Federal Reserve Bank of New York, called Morgenson and her editor to question the article’s premise, The Nation has learned. The piece has been the subject of endless parsing on financial blogs and, privately, sniping by Morgenson’s peers. Was Goldman really exposed to AIG? And if so, how? Was it fair to mention Blankfein’s presence at the Fed? It would be too much to say that the story was all in a day’s work for Morgenson. It was extraordinary. But it does open a window onto what makes Morgenson the most important financial journalist of her generation. At 53, Morgenson is at the height of her career, read and feared in the corridors of power running from Wall Street to Washington. As a reporter and columnist (a controversial dual role), she is enormously productive. During the period following Lehman’s bankruptcy, her byline appeared on major stories on Henry Cisneros and good housing goals gone bad, Merrill Lynch’s collapse, corrupted rating agencies and Washington Mutual’s boiler-room culture, in addition to the September 28 blockbuster on AIG–not to mention weekly 1,200-word columns on everything from rating-agency hypocrisy (“They’re Shocked, Shocked, About the Mess,” October 26) to a convoluted tax deal that imperiled an Indiana electrical cooperative (“Just Call This Deal Hoosier Baroque,” December 21). At this point, it is almost impossible for business reporters and editors not to have an opinion about Morgenson. Supporters cheer her tell-it-like-it-is style; detractors call her simplistic and agenda-driven. In certain Wall Street and business circles, she is flatly detested. What both sides miss, and what sets Morgenson apart, is that she combines the blunt writing style with a prodigious fact-gathering ability and an accountability mindset all too rare in the business-press culture. This allows her to go beyond merely reporting and commenting on the public agenda. She helps to set it. For the public, the financial crisis has demonstrated the degree to which Morgenson matters. We’ve just experienced a long period of radical deregulation that touched off a sea change in the business culture and at the same time created an information vacuum. How was the public to know about Wall Street-backed predatory lending and the scale it had reached? Most of the business press ducked the challenge, sticking largely to tried-and-true formulas: personality profiles, scoops handed out by insiders and after-the-fact explanations of the latest corporate scandal. And while the press did publish some investor- and consumer-oriented stories about the housing bubble, defective mortgage products and the like, it was culturally incapable of grasping the big picture–that, for instance, the financial sector had gone rogue. Morgenson got it then and gets it now. Ignoring the eye rolls of her peers, pushing back against the lawyers and the flacks, she aims her reporting straight at the heart of the matter–and in doing so points the way for a more credible business press. Many groaned, for instance, at her repeated pounding in recent years on excesses in executive compensation. But we now know that compensation lies at the center of today’s crisis, since everyone from mortgage brokers to Wall Street executives was given incentives to sell financial products without regard for their quality. Similarly, what Morgenson saw as a fairness problem became a systemic one, since income distortions left a borrower class too strapped to repay consumer loans. More broadly, her tone of urgency and accountability gave the public the message it needed to hear: something in the system had gone deeply awry. Morgenson made fairly strenuous efforts to talk me out of this profile, arguing variously that she wasn’t the story, that others in the mortgage mess were far more significant, that attention might impair her effectiveness, etc. (As a thoughtful journalist, I of course blew all this off.) Waiting for her in a restaurant around the corner from her office at the Times, I’m more nervous than I expected to be. Not helping my sang-froid was the one-word description a friend at the Times offered of Morgenson’s grimly focused demeanor in the newsroom: scary. She sweeps in–tall, blond hair well coiffed at shoulder length, blue eyes, carrying stuff, chattering apologies about being (two minutes) late–and I’m relieved and surprised to find how quickly it feels like I’m talking with an old friend. Over eggs and granola, she is chatty, even dishy and disarmingly open. At a certain point, though, I touch a nerve–something to do with her prerogatives at the Times, I think–and the chitchat ceases. Her eyes narrow and now seem icy as she stares across the table. I start to understand what it is like to face off against her. But that’s part of the formula. She has a lot of power for a business reporter, and she acts like it. When I ask, for instance, what she thinks of her former employer, Forbes–a question that would seem to call for some diplomacy–she says simply, “Awful. Terrible.” Breaking a few more industry taboos, she then unfavorably compares current Forbes editor William Baldwin with his predecessor, the late Jim Michaels, one of her mentors. What becomes apparent over several conversations is that Morgenson is a business reporter–no more, no less. She’s more likely to mention investors as her main concern than readers or “the public.” Her views are pragmatic, sometimes small-bore to the point that her detail-laden writing can turn off casual readers. Her fixes are meliorative and not particularly original–better regulation, more competition. Her radical idea is, basically, that regulators should regulate, rating agencies should rate according to the merits of the credit, corporate compensation committees should set executive pay at arm’s length, directors should look to the interests of shareholders first, large shareholders should act like the owners they are and mortgage lending should be something other than a game of three-card monte. That these views are seen as “antibusiness” in some circles tells us less about Morgenson than about the ethical breakdown among this generation’s corporate elites. “If you’re going to believe this is an ownership society where you’re going to take part in the upside, if you’re going to participate in a sort of populist form of capitalism…you have to be confident that the agents have your best interests at heart,” she says. Morgenson was born in State College, Pennsylvania, the daughter of liberal parents. Her father was an academic psychologist who later taught at Wilfrid Laurier University (in Waterloo, Ontario), and her mother was a librarian. Her parents split when she was 10, and she moved with her mom to Oxford, Ohio. Her ambition as a girl was to be a reporter for the New York Times. After graduating from her parents’ alma mater (St. Olaf College, in Northfield, Minnesota), lacking contacts, training or much in the way of money, she nonetheless boarded a plane for New York City and eventually landed a job in journalism–as a secretary at Vogue reporting to, of course, a tyrannical editor. (“It was ‘devil wears Prada,’ totally,” she says.) She later moved up to a low-level editorial job (“assistant slave,” as she puts it), then began to write personal-finance columns. But at a salary of $10,000 a year, she found she couldn’t afford her new profession and left for a better-paying job on Wall Street. Retreating to the relative moral high ground of journalism, she cadged a six-month trial at Money magazine and eventually a job at Forbes, then known for its hard-hitting business investigations. She rose quickly, learning at the feet of Michaels, the magazine’s defining personality and editor from 1961 to 1999. A taskmaster (he could be “nasty, frightening,” she recalls), Michaels stressed the importance of assembling an armada of facts in reporting and cutting to the chase in writing. Don’t leave it to the reader to sort it out, he preached. It was under Michaels that Morgenson became Morgenson, rattling off a series of investigative coups. A 1993 bombshell that found the entire Nasdaq trading system was tilted to favor stockbrokers over investors led to a historic $1 billion antitrust settlement with Wall Street firms. Another Forbes story took aim at the mid-1990s euphoria surrounding “boiler rooms”–registered and licensed small brokerages that were in fact criminal enterprises. The firms cold-called and bamboozled thousands of people into investing in plausible-sounding tiny public companies the brokerages secretly controlled. And while all business publications covered the resulting criminal cases, only Morgenson traced the frauds of one particularly malignant firm, A.R. Baron & Company, to its financial backer and back-office services provider: Bear Stearns. The story detailed an intimate relationship between a criminal enterprise and a Wall Street bank, including unheeded letters from frantic investors pleading with Bear to cancel trades they had never authorized. The piece, incredibly, also traced the relationship between Baron principal Andrew Bressman and Richard Harriton, a top Bear official. Bear later agreed to pay $38 million (and got off incredibly easy) to settle charges brought by the SEC and the Manhattan district attorney, Robert Morgenthau. Harriton agreed to pay $1 million and was barred from the business. The business press generally goes to great lengths to avoid this kind of straightforward investigative reporting, which is why Morgenson’s approach has been so badly needed in recent years. After all, the mortgage crisis was nothing if not the Bear/Baron model writ large. It is generally conceded today that Ameriquest, Countrywide, Washington Mutual, Citigroup–all the brand names, in fact–were running boiler rooms underwritten and incentivized by Bear, Lehman, Merrill Lynch and the Wall Street securitization machine. The business press did not cover it then and still hasn’t gotten its arms around this phenomenon. If readers are wondering why they were surprised by the mortgage crisis, this is the reason. Morgenson arrived at the Times in 1998, an ascension that brought an investigative, accountability-oriented sensibility to a highly visible outpost. Reading through years of her work in one sitting isn’t an entirely pleasurable experience–it can feel like you’re being pummeled by a sock filled with wet sand. But even so, a reader is struck by her mastery of technical details, the force of her prose and, mostly, the underlying insistence that capitalism be made to work for everyone, not just the big shots. Her work in the run-up to the tech bubble was characteristically skeptical and investor oriented. Common causes of columns and stories include, besides compensation reform: shareholder rights; effective corporate governance; nonrigged arbitrations; anti-gouging; full disclosure in consumer lending; and fairness in bankruptcy, foreclosure and other legal proceedings. Her 2002 Pulitzer Prize for Beat Reporting was officially awarded for stories that plumbed bogus Wall Street stock research and the dangers of off-balance-sheet financing. But in an era of spectacular business corruption (Enron, WorldCom, etc. ), I suspect the Pulitzer judges, who were not business news specialists, also appreciated her confrontational approach. Not everyone does, of course. A handful of bloggers, including the late Doris Dungey (known as Tanta) of Calculated Risk and University of Illinois law professor Larry Ribstein, have created large bodies of work debunking and mocking her and picking her apart. Ribstein, who calls her Morgenscreed, particularly objects to the Times allowing her to write both an opinion column (“Fair Game”) and straight news, sometimes on the same subjects. In a column last November, the Times‘s public editor, Clark Hoyt, tut-tutted the paper for the practice (Andrew Ross Sorkin, among others, is also allowed the dual platform) but not very convincingly. The critiques, most centering on Morgenson’s alleged oversimplications, come across as arguments about wallpaper design in a burning house. Bloggers, for instance, hit the roof over a Morgenson column last September arguing that the newly nationalized Fannie Mae and Freddie Mac should be made to disclose details about the individual mortgages they’d bought or guaranteed in the past decade. Ribstein found the idea an example of her “extreme idiocy.” Others would wonder what’s wrong with it. In the Times‘s famously baroque culture, some people are known to have power, and others aren’t. Morgenson has it. She’s not known as a shmoozer but as one of the most efficient staffers at the paper: in at 9:30; out, incredibly, around 6. And while she’s a cheerful and cooperative colleague by all accounts–helping out younger staffers, waiting her turn at the salad bar, etc.–she doesn’t hesitate to assert her undefined but very real prerogatives. Editors ask her questions and make suggestions. They don’t give orders. The downside, according to a midlevel editor, is that Morgenson is not particularly open to nuance or different points of view. This person says the system can lead to a kind of orthodoxy and groupthink that deadens reporting. Morgenson’s views on executive compensation, for instance, are hardly out of step with the “way people think” around the Times, the person notes. That said, her clout has its limits. In 2003 the Times business section was getting an overhaul. Its editor, Glenn Kramon, was moving up and out. Jockeying began for a successor, with internal candidates including Jim Schachter, now editor of digital initiatives at the paper, and Winnie O’Kelley, a business editor with whom Morgenson has been particularly close. Instead, executive editor Bill Keller chose Lawrence Ingrassia, who had run the Wall Street Journal‘s “Money & Investing” section. While many believed Ingrassia had breathed life into a stale operation, some at the Times viewed him (unfairly, in my view) as a cheerleader for the tech bubble, mainly because of his frequent appearances on CNBC during the late ’90s. Some also believed he didn’t “get” the investigative, accountability-oriented journalism Morgenson practices, favoring instead the kind that depends on access to power. However one parses all that, few would argue that the business section has not dramatically improved in recent years. Despite a relatively small staff (the Times has about 110 business journalists; the Journal, about 700), it is reasonably competitive on major stories and has assembled a cadre of reporters capable of strong investigative work, including Diana Henriques, Charles Duhigg, Vikas Bajaj, Louis Uchitelle, Stephen Labaton, Louise Story and Peter Goodman, supplemented by Jo Becker of the investigative staff. Morgenson, Ingrassia and the Times business staff have produced some of the best coverage of the crisis, particularly the “Reckoning” series at the end of last year, which included exposés on major themes: the predatory practices at Countrywide, Washington Mutual and other brand names; compromised regulation; skewed compensation incentives; even the role played by the person in charge of the regulatory system, George W. Bush. The paper’s news coverage has been complemented by strong editorials, many written by Teresa Tritch, a former staffer at Money. 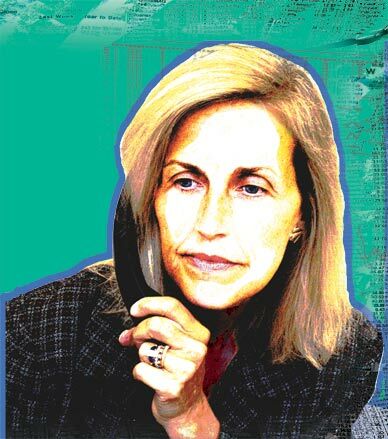 Morgenson’s approach has obviously been vindicated by the crisis, and she continues to help steer the public agenda. A story in April (with Becker as the lead byline) deftly revealed Timothy Geithner’s longstanding social and professional ties to some of the leading culprits in the financial mess, including Robert Rubin (a longtime mentor), Sanford Weill (who, the story revealed, pushed Geithner to head Citigroup) and executives at money manager BlackRock (which got a no-bid bailout contract from Geithner’s New York Fed). A June 1 story peeled back Wall Street lobbying efforts to dilute the regulation of derivatives, and unearthed a key lobbyist’s memo that has helped shape the Obama administration’s policy-making. Like newspaper crusaders of old, Morgenson has sided with the little guy over the big guy, revealing, for instance, that Countrywide’s predations continued even after its borrowers had filed for bankruptcy. A series in 2007 and last year reported that the lender had destroyed or “lost” $500,000 in homeowners’ mortgage payments, then imposed additional penalties and fees, and presented to the court “re-created” letters that had never been mailed to homeowners. A little-understood aspect of Morgenson’s approach is that she avoids a business-press tendency toward over-sophistication and goes after the big, honking story, the kind that rings alarm bells in executive suites. Goldman, which adamantly contested Morgenson’s premise that it had been exposed to AIG’s failure, received support from a surprising quarter: Geithner, who called Morgenson on her cellphone the day the story ran, a Sunday. “I think they were fully hedged,” he told her, according to people familiar with the call. Translation: Goldman had no exposure because it had bought insurance from third parties. The dispute continues. Goldman officials have repeated that Goldman’s exposure to AIG was “not material,” in effect disputing Morgenson’s premise. The meeting between Blankfein and Morgenson in April did not resolve the question. But even conceding Goldman’s main point–that $10 billion was covered at the time of the bailout–the bank still had another $10 billion exposed, the value of which easily could have, and probably would have, plummeted absent a bailout. One could argue that with Goldman’s immediate exposure covered, the AIG bailout didn’t benefit Goldman directly and that Goldman benefited no more than other banks. But the AIG bailout clearly mattered to Goldman–and would come to matter more as additional bailout funds flowed to the bank, totaling $12.9 billion. The Times stands by the story, and the story stands. Dean StarkmanDean Starkman is an assistant managing editor and the Kingsford Capital Fellow at Columbia Journalism Review; he runs "The Audit," CJR's online business-press section.